BE OUR GUEST! JOIN US FOR OUR JUNE CLASSES! 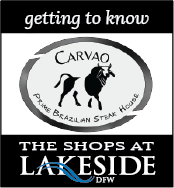 Carvao Brazilian Steakhouse Is Coming To Lakeside DFW! Flower Mound resident Paulo Novaes is talking excitedly about Carvao Prime Brazilian Steak House. The food, the drink, the ambiance, specific customers he’s determined to attract, and construction details (like the huge custom-made grills coming from Brazil). 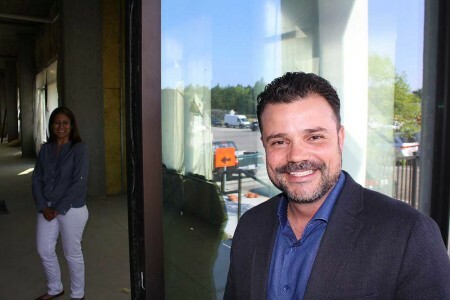 Novaes and wife Cecilia expect to begin greeting customers in their 6,400 sq. ft. space in Building One at The Shops at Lakeside by September. White table clothes, Novaes suggested, will set the tone for an environment in which customers will feel comfortable having a beer, enjoying the extensive selection of wines, or sampling Brazilian-style cocktails. Carvao will feature an extensive salad bar, including cold cuts and seafood. “Our intention is to satisfy every customer,” Cecilia emphasized. As for the menu, Carvao will mirror its owners — genuinely Brazilian but full of American ingenuity. Novaes, who originally came to the US from Brazil 17 years ago, brings a lot of business savvy to his new venture. But most of that experience was gained in the construction business. For the last 14 years, he’s owned and operated fn contractors. “Opening a Brazilian restaurant is something Cecilia and I have talked about for years,” he said. “We are grateful to be able to bring Carvao to Flower Mound. Then there was the matter of a location. “Now, we have finalized our staff that combined has over 250 years of experience in the business of running a Brazilian steak house. “We start on the finish-out in a week or so,” he added. “I feel very comfortable with that part of the business. I’ve built a few Brazilian steak houses before. “Starting a restaurant is a risky business,” Novaes acknowledged. “It is exhilarating. I am so pumped. What Was The Good News For May 2015? Kubota Tractor Corp. and Kubota Credit Corp. announced that they will move their headquarters to Grapevine from the Los Angeles area. The relocation is projected to create at least 344 new jobs and $51 million in capital investment in Texas. The state of Texas extended Texas Enterprise Fund grant offer of $3.8 million to Kubota. The move is expected to occur in the next 18 months. Employees at a Fort Worth office and in Georgia also will move to the Grapevine headquarters, the company said. The new headquarters will be on a 25-acre site just northeast of Grapevine Mills on city-owned property. Annual rent increases across the U.S. last month outpaced the rise in home prices for the first time in at least five years, a milestone that should spur potential home buyers. Nationally, average rental rates increased 4% year over year, and in the DFW area, the average increase was 6%. An Urban Land Institute survey showed that nearly all millennials expect to be homeowners, but many are choosing to remain mobile while awaiting a better career opportunity. 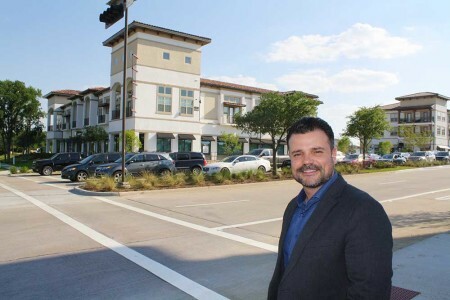 CoreLogic — an international property information firm that is based in Southern California — is considering an office consolidation at the Cypress Waters development on LBJ Freeway. The company would consolidate its Richardson and Westlake offices into a new 325,600-square-foot building that would be ready in mid-2017. 1,300 local workers would consolidate in this location and 300 workers will relocate from Tennessee, North Carolina, Georgia, Oregon, Colorado and Maryland. The company said it intends to create an additional 200 jobs that would work out of the $68 million office project. According to the U.S. Department of Commerce, Texas was identified as the nation’s leader in foreign exports and total job creation resulting from such sales. More than $289 billion in goods and 1.1 million jobs were supported from the Texas export market in 2014, a staggering lead over California, which ranked second and had $174 billion in goods and 775,000 jobs. About a fifth of Texas’ $289 billion ($59.1B) in exported goods last year were petroleum and coal products, with computer and electronic products, valued at $46.6 billion in 2014 being the next-leading category of exports. There are only about 3,100 finished, vacant new houses in North Texas — a fraction of what would be expected in a market with almost 7 million people. This year’s wet weather, shortages of labor and lots, and rising construction costs are constraining housing production in North Texas. New home starts in the D-FW are still about 50% below where they were before the recession. The good news is that home buyers with a home to sell can contract on a new build and have plenty of time to sell their current residence and make their moving plans. Whether you’re planning to furnish a new build, or you’re simply seeking to give your current home a makeover, you don’t have to break the bank to do so. There are countless ways to make a big impact easily and affordably. There are also several do-it-yourself options that can save a bundle on unnecessary labor costs. Here are some ideas to design your interior spaces on an easy budget. Adding a splash of color, or changing the hue in a room, is a very simple way to make an immediate impact. Paint is relatively affordable, and if you tackle the project yourself, it becomes an extremely economical way to make a dramatic statement. Consider painting an entire room, or just an accent wall for a more subtle impression. Fresh paint can also do wonders for old furniture. Consider a completely new color for furniture, or a weathering technique to provide a rustic or even vintage look. A whole kitchen remodel can become extremely pricy. Painting old or slightly dated cabinets is a great way to offer a fresh look at a fraction of the cost. Adding new hardware and drawer pulls provides extra character and charm both easily and affordably, to kitchen or bathroom cabinets. One of the best ways to furnish or decorate an interior on a budget is to do it yourself whenever possible. Utilize your existing personal talents, but also don’t be afraid to step outside of your comfort zone and attempt a new project. Instructional videos and books can assist in walking you through new projects step-by-step. Of course, YouTube is a great place to find inspiration or instruction, should you need either. Consider installing your own tile, laminate or linoleum floors or refinishing the wood floors you already have. Install updated plumbing fixtures or light fixtures to add a modern touch, and also save on utility costs. Refurbish previously-owned or antique furniture as opposed to buying new. You could even consider crafting your own unique window treatments, utilizing the many ideas and tools available online. Pinterest is a great place to find inspiration for do-it-yourself project ideas, including wall décor, unique shelving options, headboard ideas, fireplace makeovers, coffee tables or even crafty light fixtures. When considering do-it-yourself decorating options, see if you can use things you already have around the house that will cost you nothing. Cut and display decorative grasses, ivy, cattails or seasonal flowers. Dry the flowers and grasses to create wreaths or swags to be hung, or use them for display in vases or decorative bottles and vintage jars. For a project the entire family can enjoy, consider hand-crafting your own scented candles that can be used in any room. Another family decorating idea: Frame and display your child’s artwork, family photographs or landscapes that hold meaning, as opposed to purchasing pricy artwork in stores. Be mindful and creative when shopping for home furnishings on a budget. Shop at flea markets, antique shops and garage sales for statement pieces such as bedroom sets, dining sets or armoires that can be refurbished to fit your style and taste. Browse websites such as Craig’s List for unique bargains, or even look for contractor specials on premium, previously unused items. Keep function in mind when planning budget kitchen décor, as opposed to purchasing unnecessary knick-knacks. Hang pots and pans for both use and charm, or fill and showcase decorative jars or canisters with kitchen essentials. Display large serving platters and baskets, and fill them with edibles such as seasonal fruits or vegetables. Hang everyday mugs on a fashionable rack and store cooking utensils in a trendy wire caddy or unique piece of pottery – or even hang them from metal brackets or a utility rail to add style and save counter space. Decorating or refurnishing a home on a budget can be both fun and easily achieved. Remember to be clever and creative, shop wisely, and do what you can to save money while in turn crafting a unique and meaningful environment the entire family will enjoy. Check out these AMAZING performance STATISTICS for Keller Williams Dallas Metro North! BOLD FOR BUSINESS IS COMING TO NORTH TEXAS!!! You’re invited to make your business BOLD for free! I’m sure you’re curious what that means. He has now made his flagship training program, BOLD, available to ALL businesses and sales professionals. Your local KW team has been selected as an inaugural launch location. BOLD is about business growth, business success and personal development. BOLD is a training AND conditioning program that instills success habits. In fact, in the real estate space, over 60,000 agents have completed the program and during their short 7 week programs, the average BOLD participant had 14.2 contracts in just 7 weeks. Compare that to the national average of all real estate agents of just 5.4 contracts PER YEAR! Business owners and sales professionals who attended the BETA of the new program, BOLD for Business, in Austin, TX, experienced even greater results. We will be launching June 8th, in Lewisville. All the details are in the links below. The full 6 week program is only $799.00 and you can sign up below. If you are unsure and want to experience the program first, we always offer step 1 for free. Again, the link below provides all the details. Selling a home is stressful enough for home owners, but selling a home with pets can be even more stressful. In addition to the usual concerns home owners have, clients with pets also have to consider if they should move their animals out while the home is for sale, how much it will cost to repair any pet-related damage and if pet odor will deter potential buyers. Unfortunately for pet owners, the truth is that pets can turn away potential buyers and even lower the perceived value of their home if they are not addressed prior to listing. However, when properly prepared, homes with pets can be cleaned and staged in a way that makes the existence of the pets almost undetectable. The first step is to sit down with your clients and talk to them about the issue of selling a home with pets. Most regard their pets as family members, so telling them that not all buyers like pets can be emotional. Consider making the following tips part of your listing presentation discussion so that the matter is addressed right away. If not replacing carpet, have it professionally steam cleaned. Don’t forget to also clean upholstered furniture and area rugs. Any surface that holds in pet odor should be cleaned, replaced or removed. Weather permitting, advise clients to open windows for a few days leading up to showings to help air out the home. Be cautious when using air fresheners. You don’t want buyers to be blasted with the smell of artificial flowers that scream the seller is hiding an odor. Some fresh flowers can not only help with fragrance, but also add to the home staging. Also consider air neutralizers and odor absorbing products. Rather than masking the smell, these items actually absorb odor and neutralize the air. Consider placing an air purifier in the pet’s main living area to filter the air. Replace air filters that might have trapped pet dander and odor. Over-seed the yard or patch lawn areas to repair brown spots. Fill in holes created by canine gardeners. Not only are they unsightly, they can be potentially dangerous if someone were to trip in it. If doors and/or window screens have been damaged and scratched, replace them. Clean pet hair from hard-to-reach places such as behind appliances and behind doors. If wood or laminate flooring is scratched beyond repair, consider repairing the floor. This might be a large investment up front, but it can yield great results at sale. 3. Consider that potential buyers might be afraid of animals and vice versa. Educate your clients about pet liability and discuss having the pets temporarily (either during the entire sale process or on days when there are showings and open houses) relocated if possible. If your client does not have a relocation option, talk to them about crating their animals during showings and open houses. For pets that are not already crate trained, it can take time for them to enjoy being in the crate. Suggest your client contact a pet trainer to learn how to introduce their pet to a crate. Your clients can create positive associations with the crate by giving the pet a treat-filled toy or bone to keep them busy while in the crate. This is not only essential for the safety of potential buyers, but it also protects animals from getting out of the house, getting hurt, or causing harm to others. 4. Speaking of stress, animals can experience anxiety from having a lot of strange foot traffic in their home. Potential buyers might be distracted by a stressed pet and a nervous barking. Recommend that your client talks to their veterinarian to get a product recommendation to help their pets cope with this stressful event. National pet stores sell items such as plugins that release stress calming pheromones. The plugins do not emit any scent and can last up to three months. The pheromones released are only detected by the animals and will not affect humans. Above all, when selling a home with pets remember that they are part of your client’s family. Your clients will appreciate your compassion and willingness to not only help them sell their house, but to also reduce the stress on them and their pets.